Valbuena has been in tribal politics more than 40 years. She has been active in state and national Native American affairs over a career that began in 1974 with her first role as San Manuel Housing Commissioner providing oversight for the housing program on the reservation. Over the past 26 years, Lynn has held the positions of Chairwoman, Vice Chairwoman, and Secretary/Treasurer of the San Manuel Business Committee. She is currently serving a third consecutive term as Chairwoman. Valbuena served as secretary of the National Indian Gaming Association for 14 years before retiring from the office in 2011. In 2015, Valbuena was inducted into the Gaming Hall of Fame by the American Gaming Association (AGA). She has served as Chairwoman of the Tribal Alliance of Sovereign Indian Nations (TASIN), a regional tribal organization in southern California established in 1995, since its inception 23 years ago. She is also a former trustee of the Smithsonian’s National Museum of the American Indian (NMAI) in Washington, DC. 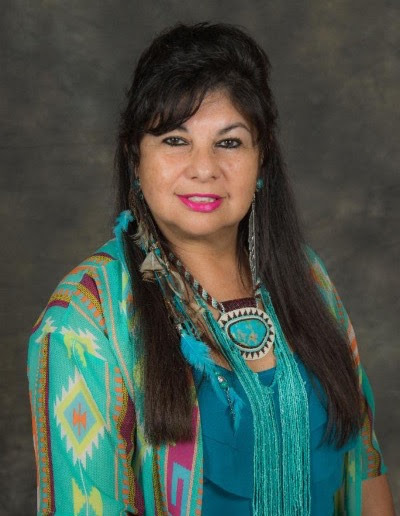 Lynn currently serves as a trustee for the Autry National Center based in Los Angeles, California, and is serving in her 23rd year as a delegate to the National Congress of American Indians, and her 18th year as a member of the American Indian Chamber of Commerce California, Advisory Council. San Manuel was the first Tribe to join the Chamber and has maintained its membership since then. She is also on the Board of Directors for the Northern Arizona University Foundation, Flagstaff, Arizona. The National Indian Gaming Association will present the 8th Annual Tim Wapato Sovereign Warrior Award to Lynn “Nay” Valbuena, Chairwoman of the San Manuel Band of Mission Indians during the Indian Gaming 2018 Cultural Ceremony on Wednesday, April 18, at the Las Vegas Convention Center in Las Vegas, Nevada.